How Do I Share Exercise Answers with Team Leaders? 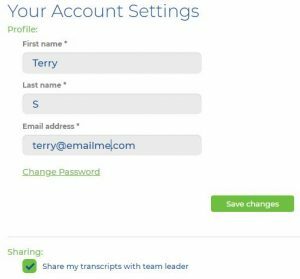 In your profile settings make sure the checkbox “Share my transcripts with team leader is checked. Click Save Changes. When you are sharing your answers the menu bar will be yellow. Click “Change” to self and the bar will turn green. Truthought GO lets you keep your work, so you can review it anytime. You can do any exercise as often as you like. It will record and retain your answers for each date that you complete an exercise. GO Teams are fun, easy and private. To join a team you need an Individual Membership or higher and an invitation from a Team Leader or you need to upgrade to a Team Leader Account and invite friends and family to join your GO Team! Before you begin a certificate course in Truthought GO make sure your name in the account settings appears exactly the way you want it to appear on your certificate. 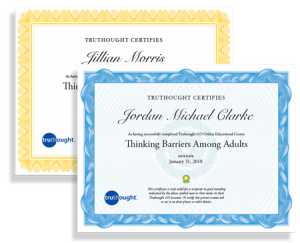 When you complete a Certificate Course in Truthought GO a badge appears next to your name on the right side of the top menu bar. Click on the badge and a list appears showing the certificates you have earned. Click on the name of the certificate you want to view or print. How Do I Upgrade or Cancel My Membership? In Account Settings you can update personal information, change your photo and other information. Select either Change Subscription, Change Payment or Cancel. If you cancel, Truthought GO will retain your recorded work for up to 6 months. If you decide to rejoin during that time you will find all of your certificates and previous work transcripts intact and everything in place exactly as you left it. The best way to purchase multiple memberships and manage them in Truthought GO. When you use a coupon or promo code you can reuse it until it is fully spent or the coupon time limit expires. Purchase only the accounts you need at any given time even if you have a coupon that allows you to purchase more. You can add more accounts later as needed. You can replace current accounts with a new member anytime. Simply click replace and add the new member email address and information. This will remove all of the personal work and transcripts from the previous account holder except for the team connections. The replacement member will start exercises afresh, but will be connected to the same team and team leader as the previous member. When you remove a member from an account the account is added back to your number of accounts available. When you need to add more accounts, consider adding another block of volume purchased accounts. Managing several smaller blocks can help you avoid ending up with more accounts than you may need down the road. You cannot reduce the number of accounts you have purchased by volume. If you find you have more accounts than you need and you want to reduce them, you will need to cancel the entire block of managed accounts. The membership accounts will continue to be active until their term ends (monthly or annual). You can start a new volume purchase with fewer accounts. To preserve user data, you will not be able to add or move email addresses from active accounts to the new volume purchase until 6 months after their original term (annual or monthly) expires. To immediately re-use or move an active account email address into another Volume Managed Account you should remove the email address from the old Manage Accounts list before cancelling the old Volume purchased account or before allowing it to expire. If you forgot to remove emails from an expired or cancelled Volume Account, you may still login to the old account and remove any email from the Account List. Then you will be able to use that email again, and the user can pick up where they left off without skipping a beat, as long as this is done within 6 months after subscription expiration or cancellation. To move Email addresses from active Managed accounts, the email must be removed from the Manage Accounts list before a user’s email may be assigned into another Volume Purchased Managed Account. Subscribers may also be added immediately into a New Volume Account anytime, by using any other email they own. Then they may be active in multiple accounts or teams, using different email addresses. You can cancel accounts anytime and they will remain active until their payment term expires (monthly or annual). After accounts expire the transcripts, certificates and discussions are held for up to 6 months. If an account is re-opened or an available email is re-used within 6 months the user will find all of their work intact precisely as they left it. It’s easy to create and lead a GO Team. You can quickly and easily assign exercises in Truthought GO! Here are the steps your team members need to take to make sure you can review their answers to exercises. Viewing team answers to exercises is simple. In this video learn how you can see a team member’s transcript. How to start Team Discussions and use Leader Discussion Plans.